How do you create greater cross-cultural understanding and challenge negative preconceptions of the “other” between our communities? This is the question we began to address when we met at an academic conference in Israel almost 10 years ago. Today, our project, “Breaking Boundaries” is creating meaningful, in-depth international dialogue between U.S. and Israeli faculty and students in both middle schools and colleges, in both Arab and Jewish schools in Israel. 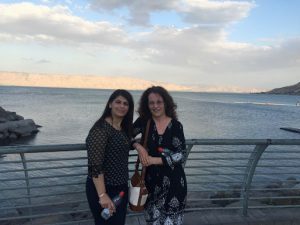 In Israel, the participating middle school teachers include Mdalale Azam from Abu Snan and Margie Bendror from Ma’ale Tzvia. In the U.S., it is Ira Pataki from the Sharpsville Area School District in Sharpsville, PA. In Israel, most Arab and Jewish students go to separate schools based on family decisions related to their children’s native language, traditions, holidays, and school proximity. Whereas the majority population of Israel is Jewish, approximately 20 percent of Israeli citizens are a part of the Arab minority population that includes Muslims, Christians, Druze, and Bedouin, as well as other small minority groups. During the pilot year, more than 70 eighth grade students and eight college students actively participated in Breaking Boundaries. The college mentors included both Arab and Jewish undergraduates from the Arab Academic College and Western Galilee College, and from Westminster College, a small, private liberal arts college in northwestern Pennsylvania where the population is predominantly Christian. T hese words echo our own thoughts as we reach out across our communities and hope to create opportunities for meaningful engagement and greater understanding of the other. This goal is reflected throughout our research, teaching, and work with students, and is a shared vision we will work towards throughout our professional careers. In our work together and in our role as educators, we are often reminded of how little our own communities know about one another, and we are sadly reminded of the consequences, both locally and globally, when personal or political decisions are made based on stereotypes or other misconceptions. Our work to achieve greater understanding of the “other,” particularly between Israeli Arab and Jewish communities and the U.S., includes multiple age groups beginning with 13-year-old children and continuing through the young adults we work with in our own institutions of higher education. We wish to express our sincere thanks for the support of the Youngstown Area Jewish Federation, the Thomases Family Endowment, and the Frances and Lillian Schermer Trust. Their support enabled us to develop Breaking Boundaries and will allow us to expand and continue Breaking Boundaries in the current academic year. We are also extremely grateful for the middle school teachers who shared our vision and co-created Breaking Boundaries with us, and the students on both sides of the ocean who responded enthusiastically and with an open heart to break the boundaries of distance, ethnicity, and misconceptions between our communities. Dr. Randa Abbas, a 2018 HBI Scholar-in-Residence, is the Vice President and Academic Dean at the Arab Academic College in Haifa and a lecturer at Western Galilee College in Akko, Israel, where she works with Israeli students training to become teachers in Israel. She was the first Druze woman to receive her Ph.D from Bar-Ilan University in Israel. Dr. Sherri Pataki is an Associate Professor and Chair of the Psychology Department at Westminster College in New Wilmington, PA where she teaches courses in social psychology, research methods, and peace studies.